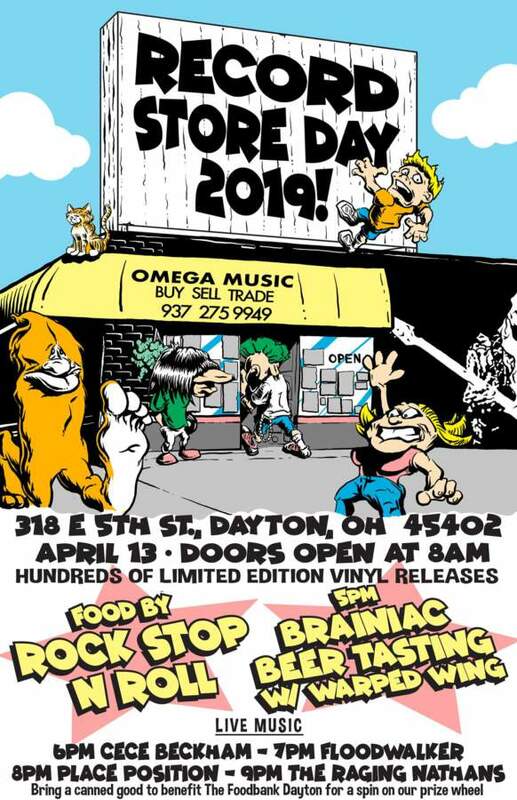 We’re celebrating Record Store Day on April 13th! Join us for limited edition vinyl releases, live music, a special Warped Wing beer tasting, and a food drive that’ll get you some great prizes! We’re always thinking of ways to keep you entertained while you’re waiting in line – this year we’re busting out the Bingo boards! If you’re here early enough, we’ll be giving out Bingo cards & playing a few rounds. Did we mention there will be prizes? If you need a little pick-me-up, our new neighbors, Wholly Grounds, will be passing out free coffee samples in the morning! This year some of our local favorites, Warped Wing Brewing Company & Brainiac have created a special limited edition beer to celebrate the Dayton music scene. Introducing Brainac – a light, golden pale ale with flavors of citrus and pineapple. Brewed to pair with your favorite jam! We’ll have 6pk cans of Brainac for sale in the morning (while supplies last!) and we’l also be holding a beer tasting in the store at 5pm. Proceeds from the beer sales to benefit our friends at Five Rivers Youth Rugby Foundation. Be sure to stop by Warped Wing after you’ve finished record shopping to show off your RSD picks! They’ll have a turntable set up for people to play their new albums in the Taproom. THE PRIZE WHEEL IS BACK, BABY! Oh yes, the prize wheel is back in action. We’re holding a food drive with The Foodbank, Inc. and will have a barrel set up for nonperishable food donations. Hand your donation to any Omega employee when you come in, and we’ll give you one hefty spin on our beloved prize wheel! If you work up an appetite while crate digging, Rock Stop N Roll has you covered. This delicious music themed food truck will be parked outside the shop pretty much all day, ready to feed the masses. -No titles can be held –NO EXCEPTIONS. -Only 1 of each title per person– NO EXCEPTIONS. -We will not know which releases we will have until we physically receive our RSD shipments– please do not ask. -We will be posting a full list the items we have on 4/12.